We tested four Bluetooth headphones, listed at less than $500, to find out which one can deliver the best sounding audio. We factored in aspects such as controls, build quality, size, and noise canceling. But audio fidelity was by far the thing we cared about most. 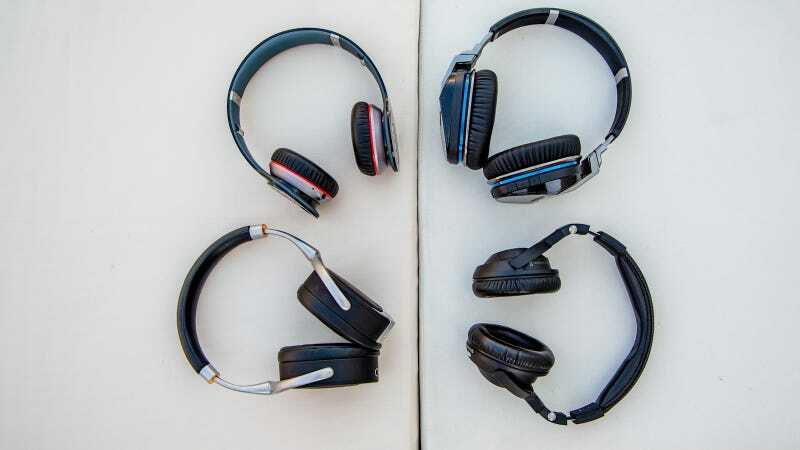 The purpose of this test was to see which pair could come closest to replacing your home headphones. Truth be told, none are better than a good pair of wired cans—they all still suffer from background hiss, they're pricey, and each has a particular, nagging flaw. But the appeal of being untethered from a stereo, laptop or media player is undeniable. Walking from the kitchen to the living room listening to loud music at 2 am is simply great. For this test, we used an iPhone and MacBook Pro with an array of 320kbps MP3 files spanning multiple genres. In addition to listening for clarity across lows, mids, and highs, we paid attention to the fidelity of the Bluetooth connection, battery life, ease of use and comfort. All the products more or less performed as advertised on the battery test, and functioned fine within a 25 foot radius (including transmitting through walls). But enough with the general info, let's talk specifics. At $280, Beats Wireless headphones have the distinction of being the cheapest headphones in this shootout, but they also look and sound like it. Bass response is heavier than normal, but it sounds good, as expected. Mids and highs, however, are a bit muddy and dark, as if those frequencies are behind a veil. This makes for a fairly confined soundstage overall. Combined with the plasticky build quality, this is a headphone you'll only want if you're on somewhat of a budget. Or if you really want a Beats logo on your head. The Ultimate Ears 9000 are the headphones for someone who wants a wireless headphone with Beats Audio-style bass, along with respectable sound quality. This audio is clearer than that of the Beats Wireless, but it still lacks some of the imaging and high-end frequency detail the two best pairs have. The Logitech also suffers from choppy audio a bit more often than the others. That said, this model probably has the most solid construction of all the headphones, and the pair is pretty damn comfortable. The cans are also the bulkiest and heaviest, making them somewhat less portable (and more likely to cause a bit of fatigue if worn for extended periods of time). The Sennheiser MM 550-Xs were actually the best sounding headphones of the bunch. The depth of the soundstage and details that came through over the bluetooth connection was downright surprising. Sure, there's still that faint background hiss, present as a result of the inevitable compression going on. But with a more neutral response curve, these would be the audiophile's pick for Bluetooth headphones (if an audiophile ever actually desired such a thing). There's just one pesky flaw: These things don't get very loud. At their loudest level—with both your phone and the headphones maxed out—it only seems slightly louder than normal. And not that you necessarily need audio blaring at a million decibels to enjoy it, but sometimes its nice to blast your music. Sadly, you won't be doing that with these. The MM 550-Xs are the lightest and most portable pair tested. They're also ugly as sin. Add in the fact that they cost more than any other pair, at $500, and it's hard to recommend these as the best Bluetooth headphones overall. Parrot has never struck anyone as a serious audio company. Sure, it makes plenty of accessories. But the nuances of audio quality as they pertain to music have never come across as Parrot's primary concern. So it's something of a surprise that the Zik headphones are as good as they are. Not just good for Parrot, but good, period. They're not quite on par with Sennheiser's offering, but they come close enough that it makes the pair's benefits too tough to turn down. Even with the Phillipe Starck flashiness (which can singlehandedly ruin things sometimes), the Ziks are the best looking headphones in this battlemodo. Plus, there's the capacitive touch panel on the right ear, which allows you to control playback with gestures. The NFC capabilities allow you to automagically pair with compatible Android phones, and a sensor stops playback whenever you take your headphones off. All of this adds up to an unrivaled user experience. There is, however, one extremely annoying flaw. The headphones ship by default with noise-cancelling, DSP effects, and an artificial EQ turned on. The only way to turn that stuff off is through an iOS or Android app. If you purchase the Zik's for use solely with your computer, there's no way to change these settings. For those without such a device, this hangup negates the entire appeal of the headphones. And it's an inconvenience even if you have the hardware. Still, this is an issue you might be able to overlook. If that's the case, then these are the best Bluetooth headphones for under $500.